After a couple of attempts to eat the pizza, I am throwing in the towel, raising the white flag and moving on. After living through an event at another restaurant in town where a drunk patron caused an enormous scene so I left I drove to ACF for a pizza. As a solo, I sat at the bar, ordered a soda and a pizza. When it arrived the first thing I noticed was the char, or should I say burnt crust. This is acceptable with certain Neopolitan varieties, but this was not the answer. Then I lifted the crust and the entire bottom was charred black, no Itake that back it was burnt. This was not something I wanted to consume, so I called the bartender over, showed it to him. His response, he pointed to the sign and said “It says right there we make our pies well done.” So I asked for the check, paid and went on my way. A manager did approach and offered a replacement, but with staf like the bartender and the kitchen staff I decided to call it a night. 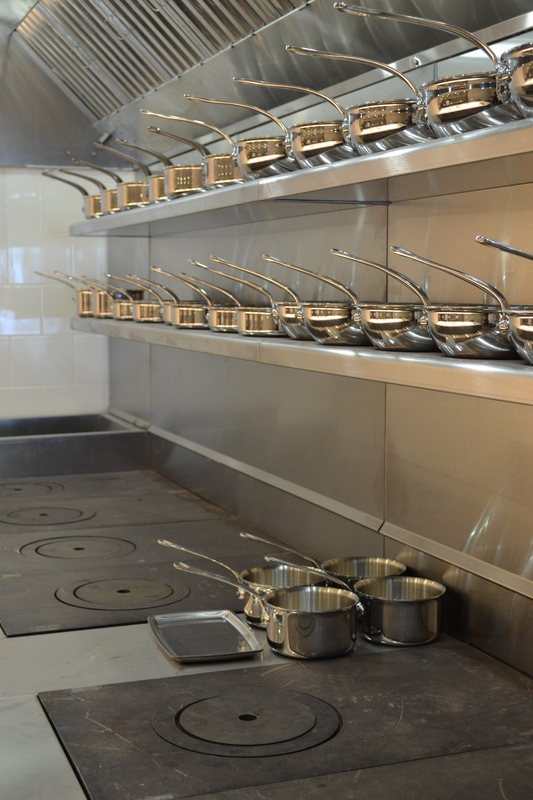 At 5:44PM on the first day of spring, March 20, 2012, the kitchen at elm Restaurant in New Canaan hummed to life as it received an order from the dining room. This was no ordinary order, it was the restaurant’s first. The order ticket began…Appetizers – 1 grilled Spanish octopus, 1 citrus cured hamachi, 1 local lettuces from millstone farm, 1 roots, shoots, fruits and leaves, and 1 soft farm egg ravioli… elm was officially open. The outstanding staff that Chef Brian Lewis had assembled sprang to action. The months of planning, the weeks of training, the hours of preparation were now tested as the guests arrived and the orders placed. As we enjoyed wine and draft beer, the server brought a pan of house-made bread that is a cross between a brioche and a biscuit, served with house-made butter topped with a smoked paprika and citrus salt. It was a delicious beginning, and over the next two hours we thoroughly enjoyed several courses and numerous dishes. At the end of the meal we all agreed that this was something special; this was an opening night meal that would be remembered as extraordinary. The high expectations that were building for weeks were greeted with superb food. 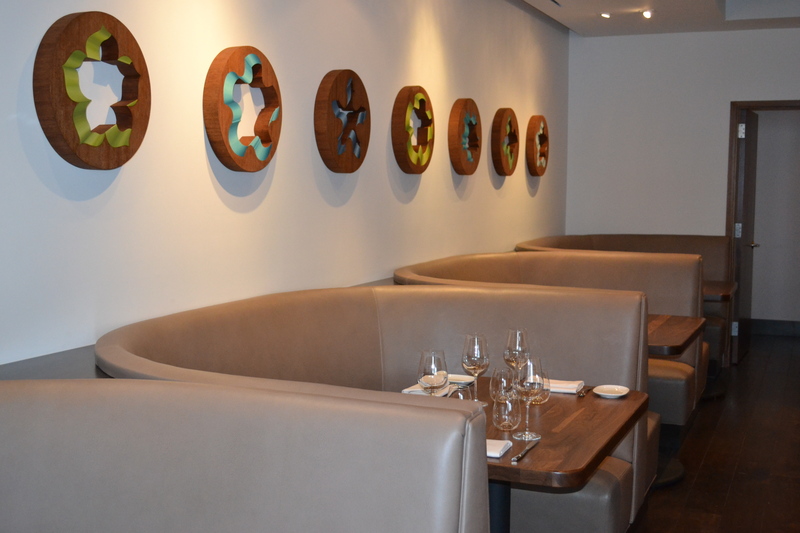 On opening night I noticed subtleties in the décor, the place settings, the service and the overall demeanor of the staff that can be described as relaxed elegance. Our server was calm, friendly and professional as she both described some of the dishes and ingredients and offered suggestions. And the nuances that Owners Laura Barker, Kristen Eveland and Chef Brian Lewis placed on each aspect of the dining experience instilled a sense of calm. Their attention to the tiniest detail created an incredibly relaxed and enjoyable evening. The appetizers are all delicious. The incredibly tender octopus is slowly braised and served with guanciale, pea shoots and served over a black aioli and topped with crisp fried garlic and smoked paprika breadcrumbs. The hamachi is a delicious trio of presentations: a tartare, a citrus cured loin and a sashimi belly. The latter is wrapped with a thin slice of Asian pear. The flavors of the hamachi are combined with several forms of yuzu and ginger oil and finished with a fennel puree, crispy shiso and red beets plus a little cilantro. 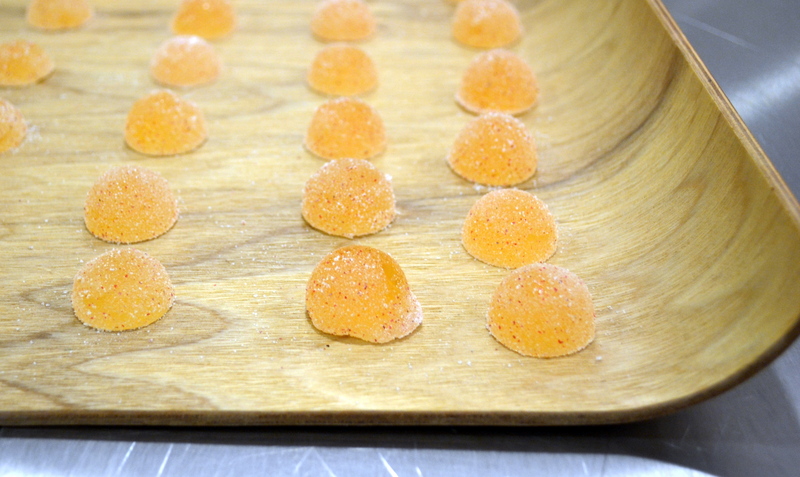 The combinations of these flavors were citrusy with just a touch of heat from the ginger and yuzu. The local lettuces and the roots, et. al. are farmed at Millstone Farms and present a variety of seasonal ingredients. 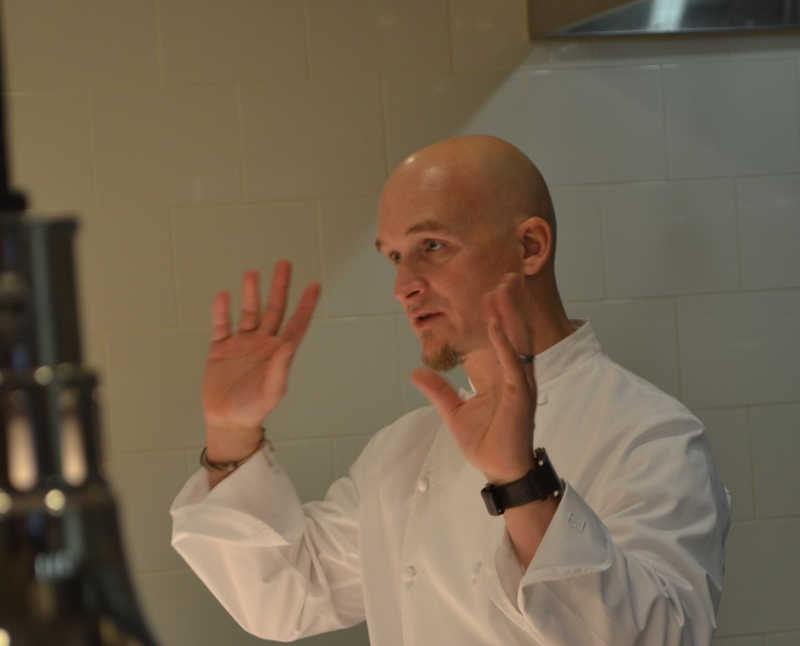 Chef Lewis prepares the roots, shoots, fruits and leaves with a variety of methods including raw, braised, confit, dried and pureed. Included in this cacophony of flavors and colors is an incredibly flavorful mousse comprised of goat cheese and medjool date puree. These last two appetizers present a crisp and refreshing start to the meal. 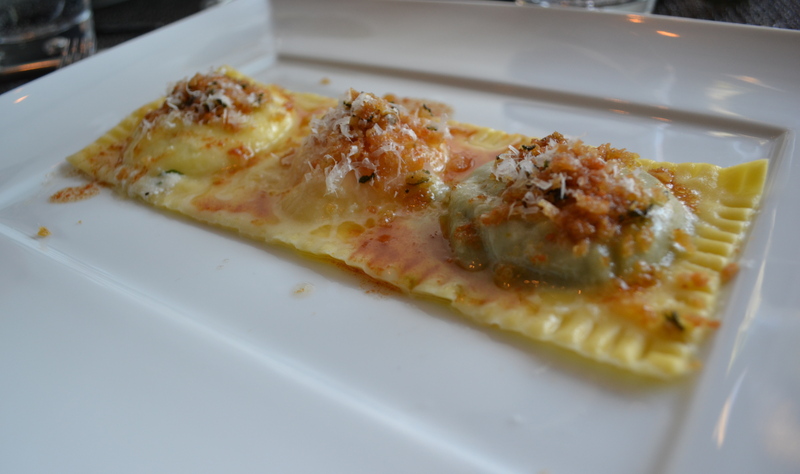 The soft egg ravioli are three raviolis, each filled with a different ingredient and are amazing. The first is filled with sheep’s milk ricotta, slightly accented with mint and olive oil. The flavors are a delightful combination. The second filling is a soft cooked farm egg yolk, that when combined with the other two raviolis, adds decadence to the dish. The third ravioli is my favorite. The filling is a spinach and parmesan puree, incredibly smooth and flavorful. We next enjoyed the Hudson valley foie gras, served two ways. 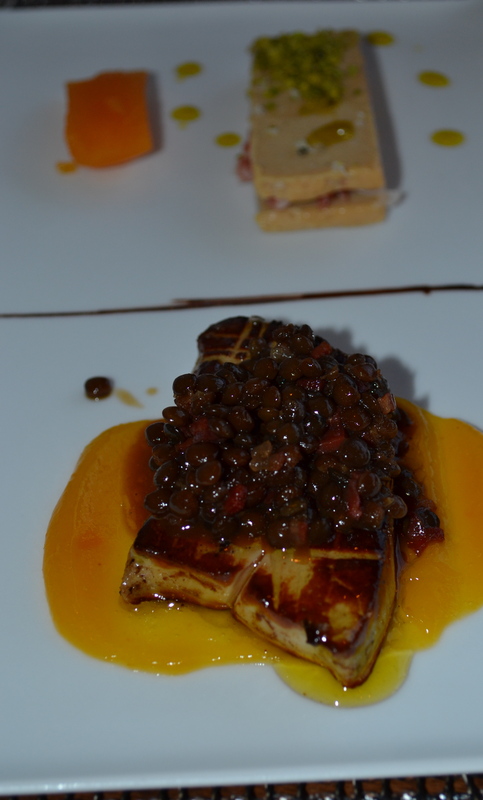 The preparations include a seared piece of foie gras, paired with apricot marmalade, and topped with beluga lentils, pata negra ham and a touch of a sherry vinegar sauce. The second presentation is a terrine accompanied with dried pistachios, some crumbled and dried pata negra ham with a touch of apricot gellee. The sweet and sour components and the different textures are fantastic. This is a true delight for those who are foie gras fans. The table ordered three extraordinarily delicious entrées; the beef tenderloin in smoked butter, the sea scallops with riso venere and the trio of local pork with pimenton. The grass-fed beef is roasted in hay and accented with smoked butter and salt, and served with oatmeal cooked in mushroom stock, roasted mushrooms, melted and crisp shallots, spinach and finished with a touch of red wine sauce. 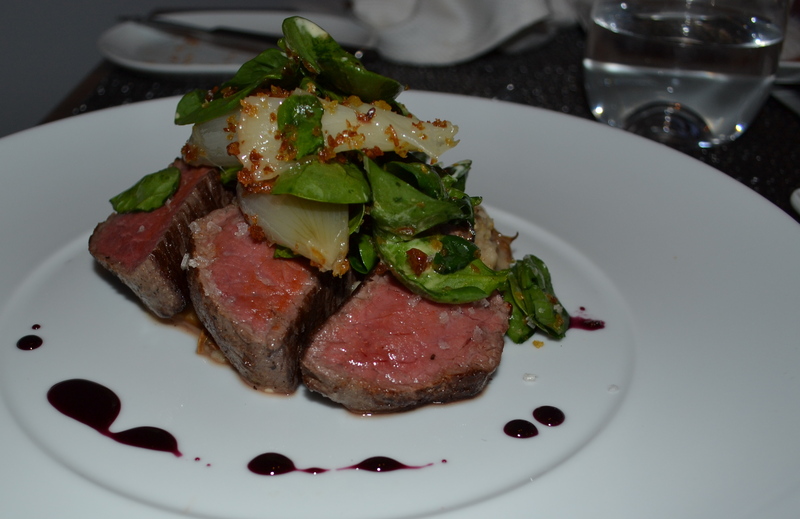 The beef is incredibly tender and flavorful and the additional flavors create a perfectly balanced and delightful presentation. The scallops are sweet and sautéed in paprika oil to a crisp exterior while maintaining the succulence of the interior. They are served with deliciously prepared Italian black rice, with a touch picholine olive salsa and a salted cod sitting atop. This is a delightful dish. The trio of pork includes pieces of belly, shoulder and bacon wrapped loin. 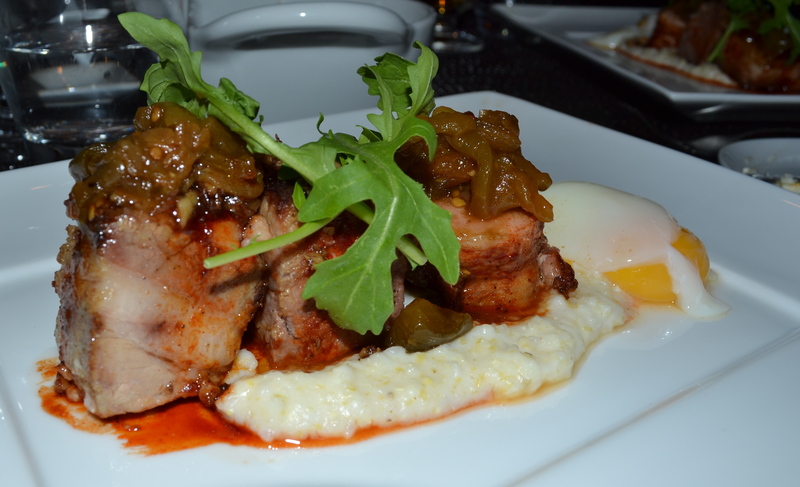 The perfectly prepared pork presentations sit atop heirloom smoked grits accompanied by a soft cooked egg. A delicious sauce of smoked paprika and smoked paprika salt combines with a green tomato jam, currents and bourbon walnuts to complete the presentation. Each piece of pork presents different textures and flavors and the sauce and green tomato jam are delectable. The desserts prepared by Pastry Chef Caryn Sabinsky are incredible. We ordered four to share including the carrot cake, the toffee pudding, the chocolate & banana, and the dark chocolate bread pudding. The carrot cake is a modern interpretation that includes a cake made with grated carrots and served aside small scoops of carrot curd, walnut brittle and caramel ice cream. This is a delightful dessert. The toffee pudding is made with a puree of dates and is served with a toffee sauce plus some crème fraiche. The sweetness of the dates and the toffee is perfectly offset with crème fraiche. The chocolate & banana contains layers of chocolate and banana cake and covered with bananas, some drizzled dark chocolate and cashews. This is served with caramel ice cream. The last dessert that we absolutely loved was the dark chocolate bread pudding. The house made bread is mixed with two different chocolates and served with vanilla ice cream and cocoa nibs. For the chocolate lovers in your group this is a perfect choice. During the evening the menu allowed us to create a wonderful tasting menu, I enjoyed eight different presentations in the pre-dessert courses and in the near future Chef Lewis will expand on this theme and present a four-course Farm Tour and a seven-course Chef’s Tour. Overall this was a wonderful evening with superb food and I look forward to many more memorable meals at elm Restaurant.